Inspired by MAD Magazine and the comic books of Robert Crumb, Ken Pontac and David Bleiman devised the concept behind Bump in the Night. Squishington, Molly Coddle and Mr. Bumpy. 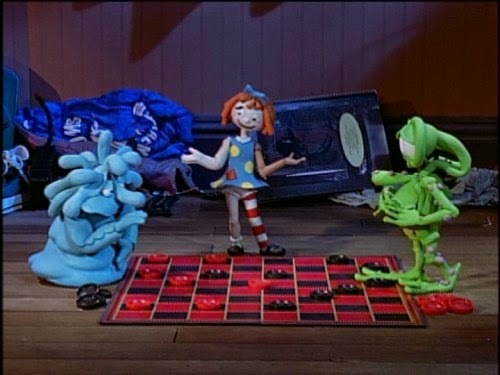 The claymation series was set in the bedroom of a human child known only as “The Boy” (Scott McAfee, played in live action on an actual set). At night, when The Boy was asleep, things in his house would come to life and have their own adventures and fun. Amongst them were Mr. Bumpy (Jim Cummings), a sock-eating green monster that lived under The Boy’s bed; Squishington (Rob Paulsen), a blue blob-like creature that resided in the tank of the toilet, was a neat-freak and a bit of a coward; and Molly Coddle (Gail Matthius), The Boy’s sister’s rag doll who had been abused to the point of falling apart and repaired using a mixture of mismatched parts. Disrupting things were their nemesis, the Closet Monster (Cummings), who in the daylight was a pile of dirty clothes and hangars, and Destructo (also Cummings), a toy robot that acted like a police man and had it out for Bumpy. 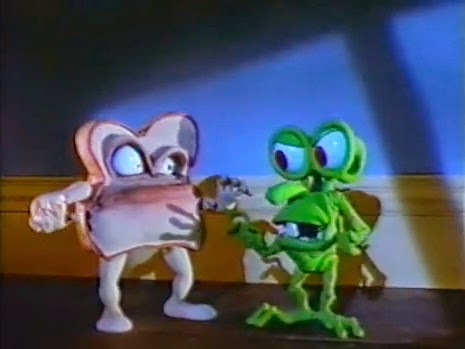 Pontac and Bleiman pitched their idea to ABC, who immediately ordered two full seasons before it ever aired. Securing a proprietary interest in the show allowed the network to impose some restrictions on the creative process, such as turning Squishington blue instead of brown (considering where he lived, after all) and ensuring nothing dangerous was depicted that the young target audience could imitate and potentially be hurt by. Despite the restrictions, Pontac and Bleiman were able to bring their vision to screens largely intact. 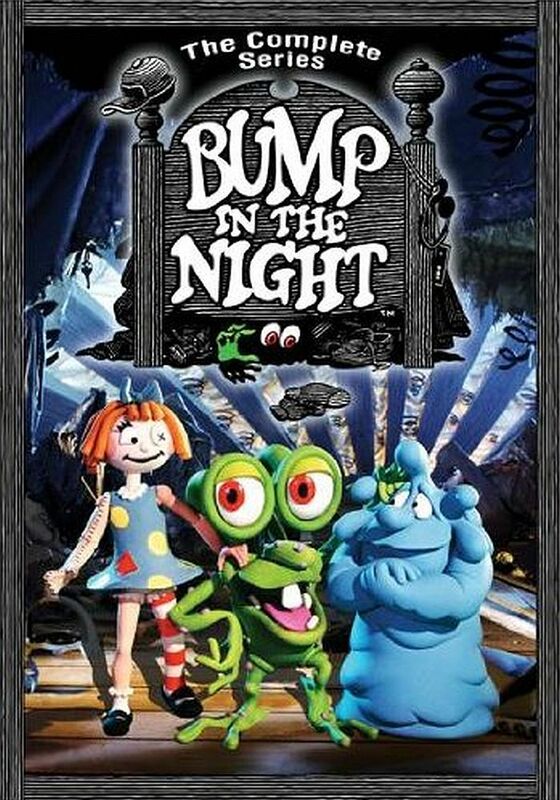 Bump in the Night debuted on September 10, 1994, however the characters were actually seen a year prior. Bumpy, Squishington and Molly were all featured in a series of commercial bumpers throughout ABC’s Saturday schedule. When the show actually aired on Saturday afternoon, it became a huge hit for ABC and was quickly moved to the morning schedule. During the summer hiatus between seasons, the show was doubled-up into an hour-long rerun block until the second season premiered to equally high ratings. Most of the episodes featured two story segments and a musical segment dubbed “Karaoke Café” in which the characters would sing a song usually relating to the episode’s themes. A couple of the stories themselves were done as musicals. Most of the songs were original compositions in different styles of music, but one episode did feature Alice Cooper’s “School’s Out.” Music for the show, composed by Jim Latham, was performed by Wayne Boone, Kevin Konklin, Eric Ferry and Ray Brinker. To save on production time, some of the first season segments were reused in the second season between new ones. Writers for the show included Mark Zaslove, James Iver Mattson, Elizabeth Stonecipher, Jeremy Cushner and Robin Quinn. Zaslove also served as the story editor. Bump in the Night might have continued into a third season, but Disney’s purchase of ABC in 1996 led to a massive expulsion of non-Disney Saturday morning programs in favor of their own programming. In 2001, Anchor Bay Entertainment released several VHS collections containing various episodes and the Christmas special. In 2003, Shout! Factory released Night of the Living Bread on DVD; a collection featuring various segments from the show. NCircle Entertainment re-released it in 2007, along with the Christmas special by DHX Media. In 2010, Shout! released the complete series as an online exclusive. In 2016, Mill Creek Entertainment acquired the license and re-released the complete series in an all-new set. “Made in Japan / Dr. Coddle, M.D.” (9/10/94) – Bumpy’s mail-away toy turns out to be a disappointment but strange things begin to happen when it arrives. / Bumpy eats Molly’s medical instruction books and replaces them with home improvement manuals. “Gum Crazy / Baby Snail” (9/17/94) – Bumpy fights with his internal organs while attempting to remove undigested gum from his stomach. / Bumpy is left to watch a snail while Squishy looks for the snail’s mother. “Hide and Go Freak / Better Homes & Garbage” (9/24/94) – Bumpy and Squishy teach Molly how to play Hide and Go Freak. / Clean Squishy is forced to move in with messy Bumpy for a few days. “Not of This Boy’s Room / To Sleep Perchance to Burp” (10/1/94) – Bumpy tries to help the aliens that abduct him take over Earth. / The Boy can’t sleep with Bumpy’s constant noise-making. “Danger-Unexploded Squishington / Loss of Face” (10/8/94) – Bumpy figures the ticking in Squishy’s stomach is a bomb. / Squishy accidentally wipes his face off on a towel and loses it. “Sock It To Me / Comforting the Uncomfortable” (10/15/94) – Squishy tries to get Bumpy off of his sock addiction. / Molly tries to comfort the Closet Monster. “Baby Jail / Night of the Living Bread” (10/22/94) – Bumpy comes to understand the hardships of babies. / An evil mutant slice of bread threatens the world. “Party Poopers” (10/29/94) – Molly wants to go to the Cute Doll party and the Cute Dolls want to invite the monsters, but while Squishy wants to go Bumpy doesn’t. “A Sneeze in Time / Hocus Dopus” (11/5/94) – Bumpy goes back in time to avoid offending Squishy. / Bumpy tries to pull a rabbit out of a hat. “Adventures in Microbia / Not a Peep!” (11/12/94) – Bumpy and Squishy are fighting against germs until a germ girl captures Squishy’s heart. / Destructo tries to keep Bumpy quiet. “Penny For Your Thoughts / Farewell, 2 Arms” (11/19/94) – Every thought Bumpy has causes a penny to fall. / In order to become less helpless, Molly rebuilds herself with stronger limbs. “I Dream of Silverfish / Story Problems” (11/26/94) – Bumpy and Squishy find a “genie.” / Bumpy tries to redo The Boy’s homework after he eats it. “The Bowl of the Squishy Prince / All You Need is Glove” (12/3/94) – Squishy tries to find a princess to kiss to boost his self-esteem. / Bumpy fights with a glove over a left-foot sock. “Long Long Day / Destructo’s Flipside” (9/9/95) – Destructo and the Closet Monster fight over possession of Bumpy. / Bumpy puts Destructo’s battery in backwards. “Love Stinks / Love’s Labor Bumped” (9/16/95) – Molly attracts the affections of a stinkbug. / Destructo develops a crush on Molly. “It Sang from Beyond the Stars / Journey to the Center of the Lungfish” (9/23/95) – Gloog and Sleemoth invade. / Bumpy, Squishy and Molly are swallowed by a lungfish. “Auntie Matta / Bumpy the Untrappable” (9/30/95) – Bumpy’s scary aunt visits. / The Boy tries to capture Bumpy. 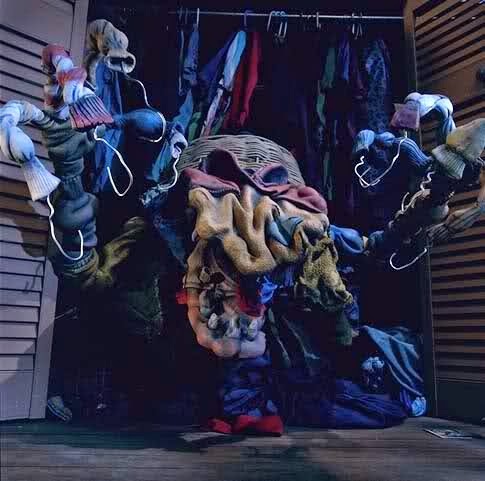 “It Came from the Closet (and Wouldn’t Leave) / All You Need is Glove*” (10/7/95) – The Closet Monster becomes the Under the Bed Monster. “Not of this Boy’s Room* / Comfort Schmumfort” (10/14/95) - Aliens abduct Bumpy and Squishy, leaving Molly behind. “Bump and Roll / Night of the Living Bread*” (10/21/95) – Bumpy, Squishy and Molly perform a musical number. “I Got Needs / Beauty and the Bump” (10/28/95) – Invading Vikings lead to a Bumpy musical number. / Bumpy falls for a china doll. “When the Music Starts / Loss of Face*” (11/4/95) – Squishington performs a musical number. “Neat and Clean / Nothing but the Tooth” (11/11/95) – “Adventures of Microbia” set to song. / Bumpy’s teeth rebel against him. “Water Way to Go / Cold Turkey” (11/18/95) – The plumber turns off the water, causing Squishy to wither. / A frozen turkey escapes from the freezer. “Made in Japan* / Made in Japan II” (11/25/95) - The little robot mails himself to Squishy to avoid destruction in Japan. “Not a Leg to Stand On / Hide and Go Freak*” (12/2/95) – Molly accuses Bumpy of stealing her feet. “’Twas the Night Before Bumpy” (12/9/95) – Bumpy enlists Squishy’s aid in heading to the North Pole to steal Santa’s sack of presents. Your posts are fun, informative and greatly nostalgic. Keep up the good work. Stick to your focus, utilize the English language properly, and above all have fun doing it. If you're having fun, your readers will have fun. Other than that, just get out there and post and post often.